Our line of 13 oz San Diego Pastel Mugs make perfect coffee mugs. This ceramic mug has a colored exterior while its handle & interior is pure white. These attractive mugs are a popular choice. The size and shape of the San Diego Mugs makes it excellent for any occasion. 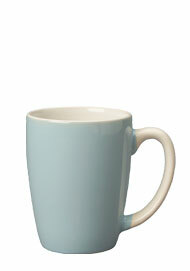 These mugs lend an extra lift to your morning cup of coffee for a fresh start to your day. Our pastel mugs are great for serving hot chocolate with mini marshmallows, cappuccino loaded with cream, hot apple cider, gourmet coffee, flavored tea, or even cold drinks.